Even though I live with people who are happy to eat leftovers 90% of the time, I love recipes that transform a leftover entree into an entirely new dish. One of these repurposed leftover ideas is to make summer rolls. 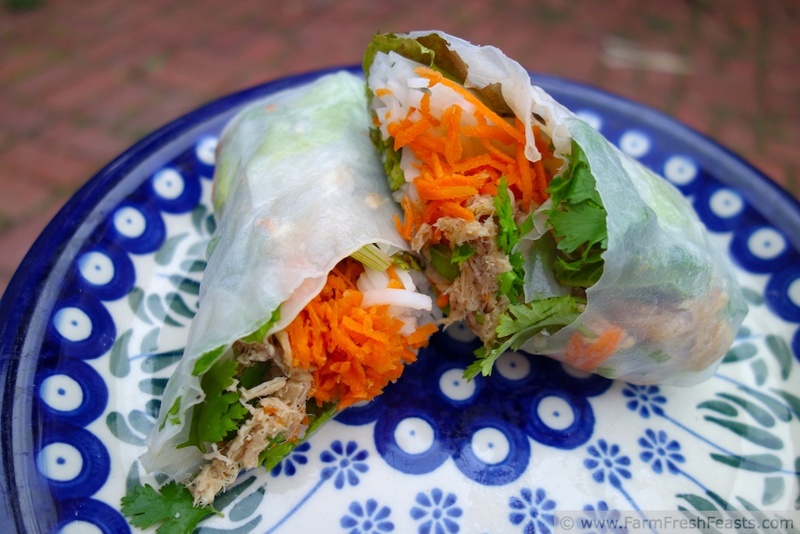 You can stick just about anything in a summer roll! I wrote this post the second month of my blog, since the chicken adobo we repurposed was from this post, my 11th post. I've been sitting on this recipe for months, since by the time I was ready to post we were fully into the Fall season and it would not have been appropriate. There's a lot of sat upon posts appearing this week on the blog. Something about the beginning of June marks summer eating for me, even if we won't hit the solstice for a few more weeks. The basic ingredients for a summer roll, however, are shelf-stable. 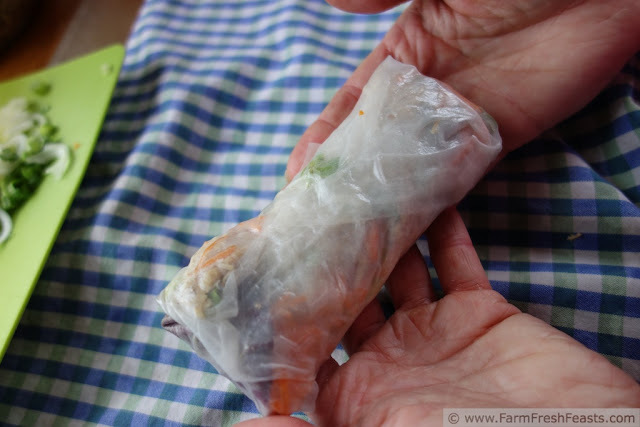 Once you've stocked your pantry with rice paper wrappers and rice noodles, you're set when the right herbs, vegetables, and even protein collide in your farm share, garden, or farmer's market. Rice paper wrappers and rice noodles can be found in Asian sections of larger grocery stores or Asian markets. If there's no Asian market near you, put this idea in your back pocket next time you're near a larger city and check out the Asian markets there for these supplies (and sushi making stuff too!). Amazon probably has this stuff, too. We did a month-long Prime trial so my spouse could get a last-minute item right before he left, and I took the opportunity to stock up on vanilla beans, caster sugar, wheat berries and peach tea. I'm set for summer. And beyond. My spouse also took most of these photos since I was doing the assembly. Man, it's so much easier with him as the photographer--trying to take the photo and direct the kids to hold things is . . . well it's just not as easy. And DIY? Blurry. Good thing I've a long history of liking to wash my hands. 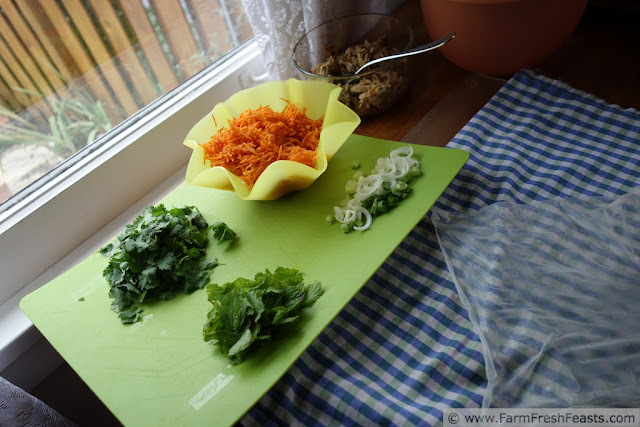 It helps me to have everything in place when I'm making sushi or summer rolls or stir fry. The S things. 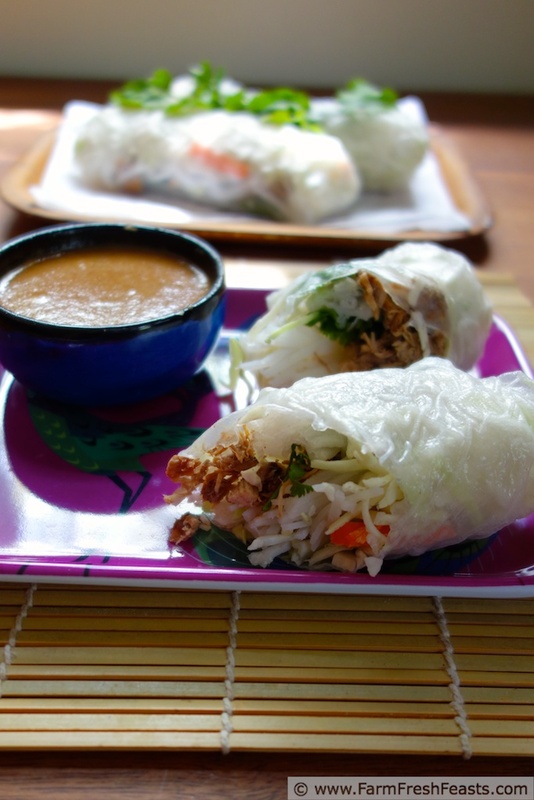 Like many dishes, making summer rolls goes quickly once you have all the ingredients ready. I like to shred the carrots using the fine shred disc on my food processor, but finely chopped or julienned works well too. Soften the rice noodles by pouring boiling water over them in a bowl and letting them soften for 15 minutes. Drain. 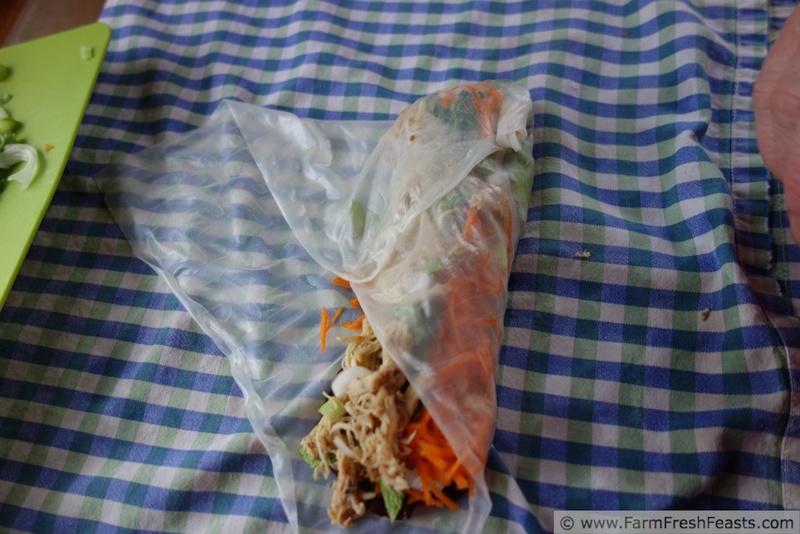 Soften a rice paper wrapper by dipping it in a bowl of warm water. I dip, then spin the wrapper to an undipped area, dip, spin, and continue until the entire wrapper has been dampened. Then I let the wrapper rest, rough side down, on a dampened cloth for about a minute. How pretty is that? I could eat it right now! Place a layer of salad mix across the bottom half of the softened wrapper. Top with noodles, carrots, onion, and herbs. 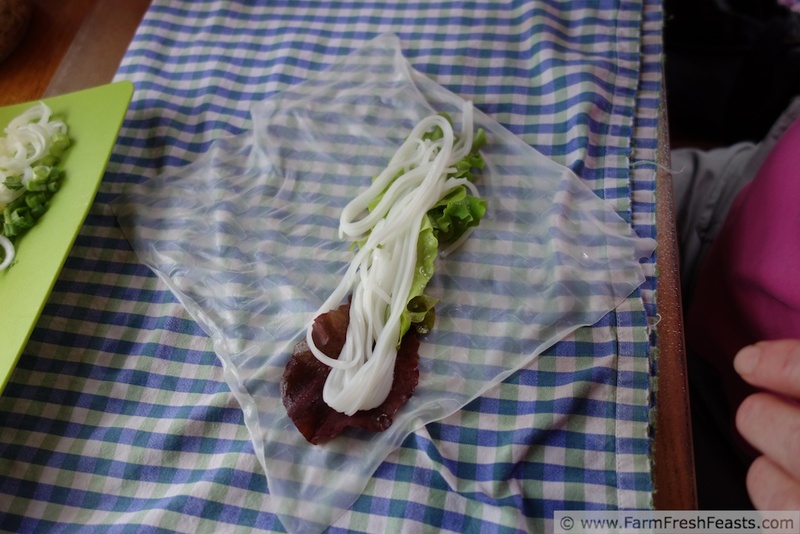 Fold the bottom first, then the sides, then roll tightly to the top. At the top of the veggie/noodle/herb stack, lay a thin layer of meat. Fold in the right then left sides of the wrapper, then roll up tightly from the bottom. Store under a damp paper towel until you've finished all the rolls. Slice with a serrated knife. I served these with 2 different dipping sauces, one peanut and one soy/sesame, but I preferred the sauce that resulted when I combined them the next day. Unfortunately, I didn't write either of those recipes down, but take a spoonful of PB and a healthy glug of soy sauce, stir together, and consider adding a splash of sesame oil, or a squirt of sriracha as a starting point to play around with. If chicken adobo is not your thing, how about Liz's Fresh Rolls with Shrimp and Honey Lime Slaw or Marlene's Fuji Apple Spring Rolls. 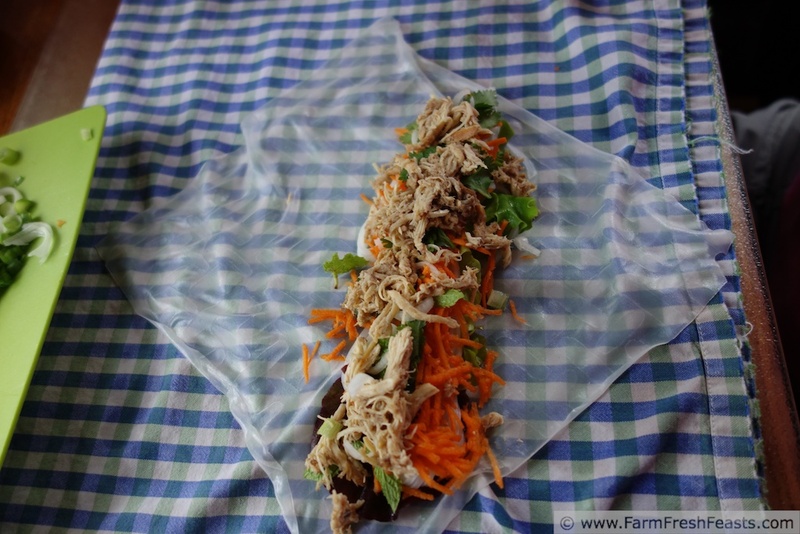 I've got a new summer roll recipe ready to go--Kalua pig summer rolls--and I promise to have it up this summer. Aloha! This post is linked up with the Clever Chicks Blog Hop, What's Cookin' Wednesday, What's In The Box, Food on Friday and the From The Farm Blog Hop. yum!! 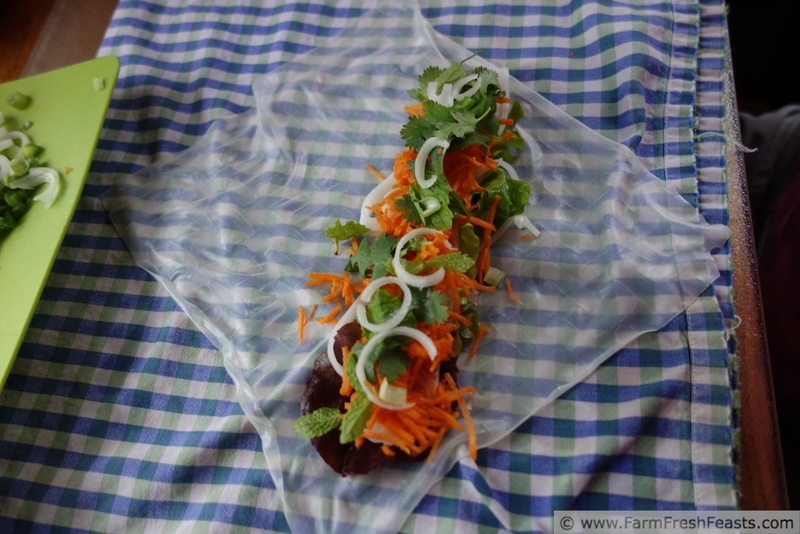 This is such a creative spring roll and perfect for these hot days. I'm glad it appeals--even though we've had a cool spring, the kitchen has started to heat up. I put up my heat-blocking window covers over the weekend. Nice way to use up that leftover chicken! The kids would be happy to eat it over rice, but I like to change it up and make it fun. Very impressive use of leftovers, and you're right, the produce picture is beautiful. Good luck with your stealth herb garden. I like the way you think, and I hope it works. My fingers are crossed for you. The chipmunk was in a tree today, harvesting some sort of fruit-type thing on my patio. A tree. A chipmunk. I sent Simon out, but I have grave concerns about the future of my strawberries. So far my perimeter defense is working on the raised beds, though--the nibbled tomatoes and fennel are coming back. great combination of adobo and the spring roll. So creative and I want one right now. I want one too. I'll settle for a bowl of cereal, though I should probably just go to bed. I really enjoy summer rolls. These look so fresh and pretty and I love that you used leftovers to make them. I love using leftovers--and I'm so glad my son just polished off last night's pizza, and then commented how good it was. High praise from a teen. I appreciate the kind words on my photos, I feel like I have so much to learn/improve. It sure beats reheating out of the same container of lasagna (ok, that's what the kids are doing since they don't want to share in the spring CSA salad greens palooza happening now). Love a new recipe and can't wait to try your great idea. Your chicken adobo rolls sure don't look like leftovers at all but they sure do look yummy. Thank you for sharing with the Clever Chicks Blog Hop this week; I hope you’ll join us again! These really do look like the perfect summer food. Portable, filling and oh so refreshing. I appreciate it. Thanks for hosting!